Here's a big collection of the best of the photos taken by our friends and family during the wedding weekend. Thank you so much for coming! We have some early photos available. ...We're off to Hawaii. See you soon! My brother, Owen Hay, will be my 'maid-of-honor'. He's been my troublemaking partner since he was born. Owen is a multi-talented guy. 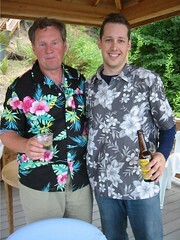 He was in charge of the bachelor party and helped pick the color for the wedding. Owen went to Union College, and majored in economics. He came to work at Amazon right after college (just like I did). He's a video game savant and has been perfecting his capoiera moves. Right now he and his girlfriend Amy are looking to buy thier first house. Owen has a huge heart and a great sense of humor. Most of you have already had the honor of meeting him. For those who haven't, I highly recommend it! My parents are Fred and Kathleen Hay. My mother is from North Tonawanda and my father is from Tonawanda, twin cities with rival high schools outside of Buffalo, New York. Even though they grew up within minutes of each other and were both nominated for the Greater Buffalo area 'Ideal Youth' award in the same year, they didn't meet until they were introduced by a mutual friend during college in Albany. They've been married for 38 years and have raised Owen and I. Their love and encouragement has helped me become who I am today. My mother majored in English at SUNY Albany. She would go on to teach 9th grade English in McDonough, Georgia, then write advertising copy, all while raising us. My love of reading comes from my mother. I remember toting around her copy of an anthology of American poetry all throughout middle school; it was dear to me. Recently, Mom has been soaking up small town life in Anacortes and working on refinishing the lower level of their house. My mother also has her own website with old pictures of me, holiday newsletters and an entire section dedicated to our flower girl, Zoe. My father went to Union College where he majored in Economics (also what I majored in.) He won the coveted title of "keeper of the jug" and was on the varsity football, lacrosse and wrestling teams. Dad joined the Army, went to business school at Indiana State, and finally joined the Detroit auto industry where he made his career in auto parts and tools. If you get a chance, ask Dad for the Japanese business trip stories, there are a bunch of good ones. Outside of work, Dad taught me how to ride my bike by holding the back and running behind me. He came to my sports matches and eventually learned to like volleyball as much as football. Dad retired a few years ago, and has been golfing all around Washington (one course hascoyotes walk beside you). He's also been traveling during the Seattle rain season. 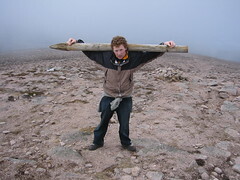 Over the past year he went to Scotland (with us), went to the Olympics in Greece, and did the great Alaskan road trip. Both of my parents and my entire family have warmly welcomed Alex into our family. I want to thank them so much for their support and for the life they've given me. Seriously... Elaine's not really a mud wrestler, but she does have a dry wit and a fabulous collection of vintage party dresses. Elaine and I had all of our computer science classes together at Swarthmore. She is the best pair a programmer could hope for. I'm honored to have her as one of my bridesmaids. Kelli was the first of my women friends from college to get married. She and her husband Eric Griffis have now been married an impressive 6 years! They lived in Atlanta right after graduation, but have recently moved to the Bay Area where Eric is doing his post-doc and Kelli is teaching at the fabulous Oxbow School in Napa. Kelli has an inner-fabulousness. 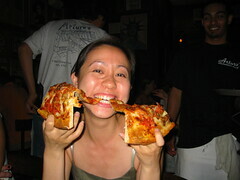 This photo was taken at my bachelorette weekend last week in New York. 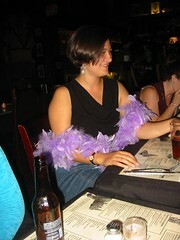 It takes a certain something to pull off a lavender boa, and Kelli does it in style. Kelli is the only person I know who was able to wear the same dress for both the wedding and the bachelorette party. Keep your eye out for her, she'll be looking fantastic! We have updated our Weekend Schedule with all the latest and greatest for Weddingpalooza '05. We're just a week away! Andrew "Bosco" Boscardin is one of my good friends who I met in the early days at Amazon.com. Bosco and I (and Paul, another groomsman) all occupied this giant shared office in one of the old Amazon buildings. It was affectionately known as "the batcave", and in it, we built the website. Once Jordan came to Amazon, she too would sit in the batcave. I remember Jordan's first day, when I took her around to meet all of the other batcave denizens. When we got to Bosco's desk, I said "Jordan, meet Bosco. Bosco is 'the man'." Indeed he was, and still is! He showed me where the good burritos were in Seattle (La Vaca), and together we looked for good east-coast-style pizza (still looking). Bosco is quite the renaissance man who does everything from classical guitar to web development.